Neil A. Armstrong, first human to set foot on extraterrestrial soil, died today at age 82. His name figured tangentially in the continuities of some science fiction games—the Armstrong Nebula in Mass Effect was a notable tribute (two other nebulae also were named for early space explorers in that game.) Moon landings have been featured much more prominently in video games since their earliest days. One web game, made two years ago for the 40th anniversary of the first moon landing, recreates the white-knuckle conclusion to the descent of Eagle, the lunar module Armstrong piloted during Apollo 11's landing phase. As is well known, the vessel's navigation computer was steering Eagle toward large boulders and a crater. Armstrong took manual control and landed Eagle safely, with very little fuel to spare. 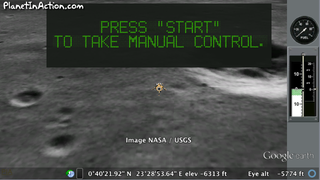 PlanetInAction.com's Apollo 11 Moon Lander lets you take control of Eagle at the moment Armstrong did, and attempt to land it softly and safely. You will need the Google Earth plugin. It is difficult. Don't expect to do it right the first time. Armstrong did, of course, and for it, his name will be remembered for the rest of human history.